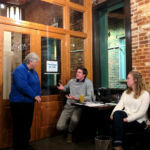 Sr. Fran Gorsuch had the honor of being the key speaker at Theology on Tap in Frederick at one of the events surrounding World Youth Day January 21-27, 2019. She spoke to Young Adults about the freedom and peace that you receive when you forgive someone and how that allows you to heal. Sr. Fran talked about how she doesn’t know which comes first – healing or forgiveness, calling them “a package deal.” Sr. Nathalie Lundolo and Ji Choi, currently in Formation with Sisters of Bon Secours, also spoke at the event. There was a great dialogue even after the speakers were finished, with Young Adults openly speaking about how they had experienced healing and forgiveness. Amy Kulesa and Lauren DeSmit (SBS Young Adult Program Coordinator) both attended and shared some photos from the event.